In 1990 the BBC broadcast a documentary, From the Heart of the World: The Elder Brothers’ Warning, which had been made at the request of the Kogi people (descendants of the pre-conquest Tairona culture) in the high sierra of northern coastal Colombia, the place they call the ‘heart of the world’. Their culture and values, based in self-sustaining agriculture and intense spiritual contemplation, had remained intact despite the Spanish conquest because they had barricaded themselves in the mountains. And so they remained until they decided they could stay silent no longer. The warning the Kogi, the ‘Elder Brothers’, wanted to deliver to their ‘Younger Brothers’ in the world was that their actions were destroying the Earth – a conclusion they had reached by contemplating the effects of the receding glaciers on their tundra, and hence on the entire water ecology of the sierra. That is, the Kogi recognised climate change a decade before politicians in the so-called developed world would believe their own scientists. (Some still don’t.) It may seem unbelievable to a technocracy dependent on instrumental logic that an extremely localised community could possess such an acute grasp of global affairs without stepping outside their place and in the absence of techno-sophisticated communications systems; but the Kogi understood themselves as ‘world citizens’ in a their own way. The artist, activist and poet Cecilia Vicuña provides a clue to understanding the Kogi perspective in her installation and performance entitled Blood of the Glacier, 2006. Vicuña connects the Kogi saying ‘The spindle is the axis of the world and to weave is to think’ to Chilean Mapuche weaving traditions based in el quipu. The knotted string, known as quipu, is a form of Quechuan script used in storytelling, poetry, accounting, and the maintenance of communal rights and responsibilities. 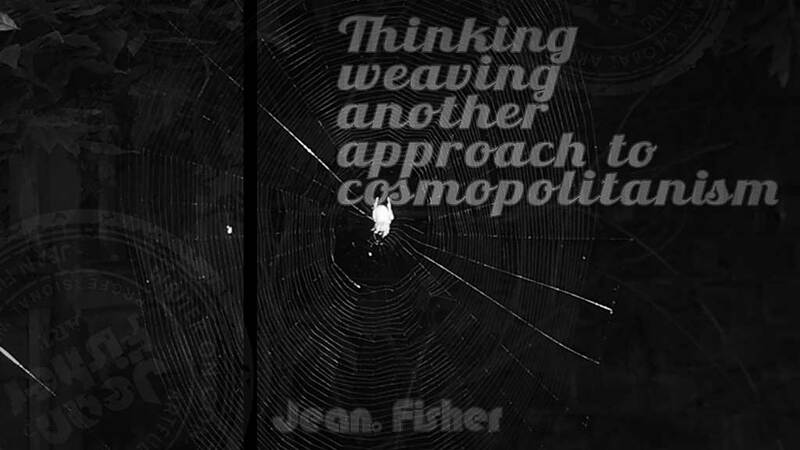 Thus we have two expressions of cosmopolitanism that lie outside the purview of metropolitan or urbanist definitions: from an isolated, technically stateless people, who nonetheless understand the reality of local independence with global interdependence; and from an international artist who unites a local with a universal symbol, where weaving as thinking is the basis for understanding and visualising the interrelation of land, people and language. It is not simply by becoming more rational that you become more conscious. Spinning and weaving, as a metaphor of world understanding, presents a striking convergence of thought between the Kogi and Marcus Aurelius, the Roman Stoic. One might also say that this is what art does: a way of weaving in material or performative forms to make hitherto unrealised connections, or to disclose the aporias in our conventional assumptions about reality. But rather than focus on art practices as such, I should like to pursue a few thoughts prompted by the theme of this Biennale concerning how we think about the world, beginning with Jean-Luc Nancy’s distinction between globalisation, or ‘globality’ – referring to the catastrophic effects of global technocratic and economic logic by which the world is made increasingly uninhabitable – and mondialisation, roughly translated as ‘world-forming’, referring to expansive processes of meaning production through genuine human interrelations, threatened by globality. Nancy points out that it is only when we see the world destroying itself that the world as such appears: it emerges when it is no longer conceived as a totalising representation from a transcendental vantage point, theological or ideological, outside the world.3 To see the world from the inside, however, means to see all its relations, animate and inanimate, without prejudice, which is why all lifeworld perspectives must be included in any conversation. The following, rather hastily assembled thoughts circulate loosely around Descartes’ axiom, ‘I think, therefore I am’, subsequently reconfigured by Jacques Derrida as L’animal que donc je suis (à suivre), or ‘The animal that therefore I am (more to follow)’ and by Brian Yazzie Burkhart as ‘We are, therefore I am’.4 What is disclosed by these reconfigurations is the extent to which thinking has been bound to (western) anthropocentrism and subjectivism, held hostage, as Nancy says, to a transcendental view of human-world relations that privileges ideological abstractions over interpretations based in experienced realities. But it is precisely (western) language that is wanting. Our language, dominated by the ontotheological traditions of the Abrahamic religions, has distanced us from the natural world, impoverishing our ability to develop non-hierarchical dialogues with it. Paulo Freire, in his classic writings on human oppression, stated plainly that dialogue cannot exist in the absence of a ‘profound love for’ and humble commitment to the world and to humankind, where the word is not just an instrument of dialogue: it possesses ‘two dimensions, reflection and action, in such radical interaction that if one is sacrificed – even in part – the other immediately suffers’.7 Nonetheless, despite his commitment to the liberatory praxes of dialogue and education, Freire goes on to make conventional anthropocentric assertions about animals based on their supposed lack of self-consciousness and agency; in Freire’s reflections, animals seem not to figure amongst the ranks of the oppressed. Regarding the possibility of rethinking our relations with the non-human world as a necessary dimension of cosmopolitan thinking, I should declare an ‘interest’: prior to fine art study, I undertook a degree in Zoology, during which time I was continually astonished at the beauty, diversity and, yes, intelligence of the natural world, alongside its struggle to maintain an harmonious balance against human depredations. Given that the entire world is composed of sub-atomic flows or particles, aggregated according to mostly invisible energy forces, the Chaos Theory metaphor of the ‘butterfly effect’ made sense (and even more so, now we see the disastrous effects econopolitical decisions made in one location of the world have on others.) This is not to privilege some facile cause-effect explanation, but to foreground the fact that every act has consequences because everything is ultimately related to everything else. This being so, for a thinking being, any singular act carries with it ethical responsibility: what violence or harm against others, human or non-human, would my act produce? It is not just the atomised individual that is at stake here, but the very concept of a relational whole. Writing in the early 1980s, David Bohm, like other philosophers attentive to scientific realities, had already identified the ecological, economic and political disasters that were leading to global instability. Bohm points out that our (western) ‘theories’ about the world give shape and form to experience; but they are simply ways of seeing, which, when taken as truths about how reality ‘really is’, exclude other perspectives and lead to limited, fragmentary perceptions and distortions of knowledge that then condition how we approach nature, society, and others.11 To value only the flower is to dismiss that of the root, so to speak. Bohm’s thinking, based in one factor that unites relativity and quantum theories – the world as undivided wholeness – is that our perception of reality is founded primarily in what can be perceived or measured as apparently autonomous ‘sub-totalities’ of what he calls the unfolded or explicate order, which presents those approximately stable projections of our three-dimensional experience. But this manifest order flows from the continuous flux of primary implicate structures below the level of human perception that ‘interweave and interpenetrate each other, throughout the whole of space’ as a multidimensional totality.12 What we perceive as empty space is in fact a plenum of energies, the ‘ground for the existence of everything, including ourselves’. The creative process of enfolding and unfolding applies to inanimate as well as animate matter, the former deviating from its own path only when, for instance, it is informed by a seed to produce a living plant;13 which prompts the question, what is the distinction between animate and inanimate if they are mutually informed by the same matter in a shared environment? Bohm further suggests that the implicate order is a creative background continuum that enfolds consciousness, since any explicit content inevitably implies implicit content (revealed in the distinction between clock time and experienced duration). However, that we tend to see the explicit order as the primary reality is the result of the intervention of instrumental language, habitual patterns of thought and enfolded memory traces, all of which register the recurrent and stable, the static and fragmented as the more easily assimilable, even though at each moment the whole ‘”holds” all the others enfolded within it’.14 But how can we think otherwise? Perhaps the most extravagant pretense of Western civilization is its tenaciously held belief that only humans matter in the scheme of things. It is worth reminding ourselves here that the war of words between Juan Ginés de Sepúlveda and Bartolomé de las Casas in the Valladolid debate (1550–1551) concerned whether or not ‘Indians’ (as they named them) were free men or, like animals, only fit to be enslaved by superior Spaniards. Thus the ethical-political debate on the assumed hierarchical distinction of human from animal has always underlined the justification for violence against the colonised ‘native’. Derrida is mindful that the very humanist and anthropocentric language by which activists advocate for animal rights presents the same criteria that historically have justified violence against them, including the assumption that the human alone possesses self-presence: ‘(lucid and transparent self-consciousness) and presence to the other (an other that is ultimately seen as reducible to the self/same)’.19 Nonetheless, whilst noting the heterogeneity of ‘animal life’, which makes a mockery of totalising definitions, Derrida retains the distinction of the human. As Matthew Calarco points out, it seems impossible to question western anthropocentric models without resorting to the philosophical language which engenders them, which is why being alert to the language and ontology of anthropocentric and subjectivist discourses is an inescapable part of the critique, even if one cannot see a way out of the impasse.20 Calarco argues therefore that, whilst continental philosophers, including Derrida, have problematised the concept of the humanistic or Cartesian subject, introducing the less autonomous notion of the subject as formed by and subjected to an Other (in psychoanalytic terms this is language, or the Symbolic order), they have not relinquished the notion of a human-animal distinction, or extricated us from the underlying primacy of anthropocentrism to their arguments as a dramatisation of human superiority. I, too, live with a cat – not so little now – who does not simply react to me. He not only sets limits which I cross at my peril and displays symptoms of boredom (who wouldn’t, living with a writer? ), but also confronts me with a range of vocal utterances, facial expressions and actions linked to specific requests to which I am bound to respond. The real distinction between us is the power relation: I have deprived him of the means of self-sufficiency, rendering him dependent for his wellbeing on my technology and generosity – an inherently inequitable, ethico-political relation that exposes my limits and puts my subjectivity in question more than his. This latter observation does not of course pertain only to human-cat/animal relations, but to human-human ones, where brutal atrocities against the weak and defenceless by hubristic, technologically (and militarily) sophisticated nations, reduces them to what Agamben, in Remnants of Auschwitz, called the ‘inhuman’ (an insensate state which, however, is absolutely not to be equated with the ‘animal’ but with the depredations of human biopolitics).21 This violation of human ethics renders the perpetrators equally ‘inhuman’ and equally unfit to be classified as ‘animals’; they are ‘thought-less’ in the sense that Arendt spoke of Eichmann’s pedestrian conformity to unconscionable orders from his bosses. The point here, following on from Arendt and the Kogi, is that the western world has exhibited a lamentable lack of thinking ethically and that proper thought on our relations to the non-human, finite world which we all share is long-overdue. The survival of any self-organizing system depends upon its ability to keep itself open to the flow of energy and matter through it. There is now a vast amount of literature on Native American world views, alas, more familiar to New Age fantasists than to philosophers. This world view is perhaps summed up by the late Standing Rock Sioux philosopher, lawyer and activist, Vine Deloria Jr: ‘In the Native American worldview each entity was bound together in a system of reciprocal relationships which western ecologists only recently have come to call the web of life.’25 Indigenous thinking was all-inclusive weaving: reciprocity, respect and gratitude in the form of gifts received and given included the inanimate as well as the animate in a sustainable ecosystem. Deloria’s ‘big picture’ of life, which included ‘both real and nonphysical things’ like visions, meant that the Indian was not bound by the measurable, rationalist expectation of cause-and-effect, 26 but, as Gregory Cajete says, by participating in the processes of chaos and creativity, which aligns indigenous thought to quantum/chaos theory. Daniel Wildcat likewise says, ‘indigenous worldviews… do not relate and connect through simple cause-and-effect mechanisms. Instead they are understood through language and culture built on ancient observations of correspondences and juxtapositions of phenomenal events and situations.’27 This prompts the tantalising question whether, like the Kogi’s, the northern American peoples’ synthesis of ecological observation with contemplation and generational wisdom opened onto an ‘implicit order’ largely inaccessible to western instrumental logic. No one in the international art world has more insistently pointed us in the direction of ‘We are, therefore I am’ than the artist, activist and essayist Jimmie Durham, who, true to his own epistemological roots, conjugates his encounters with philosophy, politics, science, history, poetry, other cultures and the world of the discarded in a critique Euroanthropocentrism. To give one example, a sculpture for the 50th Venice Biennale in 2003 included the description: ‘A piece of wood sculpted by a machine and painted by a human. A piece of wood sculpted by a dog and painted by a human.’ What Durham undermines is Eurocentric assumptions of subjectivist intentionality, cause and effect and the relationship between the animate and the inanimate, revealing, not without humour, an ’other’ dynamic relational universe in which all participants, included the artist and viewer, are assigned equivalent actional positions.30 Moreover, Durham once said that he intends his work to open a space of doubt and confusion, in which the viewer is not belittled or intimidated but encouraged to think. That western scholars and scientists have recently turned their attention to indigenous knowledges is little cause for celebration. In the first place, Deloria cautions us about how much knowledge was lost with cultural genocide, how much of the old wisdom has had to be reconstituted through discontinuities in generational oral transmission and, ironically, through the written and interpretative accounts of white ethnographers. And Pavlik, too, questions the extent to which Indian communities have retained indigenous thinking in the face of overwhelming external pressures. More troubling is what Laurie Anne Whitt calls the ‘biocolonialism’ of indigenous knowledge, especially in the domains of spirituality, agriculture and medicine: the commodification, privatization and commercialisation of the natural world and genetic life-forms, including the USA’s efforts to impose its Human Genome Diversity Project on indigenous peoples, despite the lack of clarity on the future ‘applications’ of this material.31 Needless to say, agricultural and pharmaceutical corporations do not offer indigenous peoples intellectual property rights on knowledge nurtured and developed over millennia. However, despite annihilation and acculturation, enough indigenous knowledges survive to indicate that they present ecospherical ‘cosmopolitan’ models of co-existence. Global interdependency now demands cooperation in economic and socio-political relations that include the biosphere; but can this only be nurtured by re-empowering the local, which is the place of our experienced lifeworlds? Whilst urbanist postcolonial studies have seldom attended to ecology, they have led to a re-examination of cosmopolitanism as the antithesis of neoliberal capitalist globalisation and ethno-nationalism. Revised thoughts on cosmopolitanism do not mean ‘élite life-style choices’, or ‘globalism without attachments’, but refer back to the Stoical view by which I introduced this text. Kwame Anthony Appiah called cosmopolitanism an ‘adventure and ideal’, defining it as ‘respect for difference with a respect for actual human beings’; meaning, a universalising of shared human values, needs and security, but not an homogenisation of ways of life.32 In Ulrich Beck’s terms, cosmopolitanism is a practice that strives towards enabling everyone to make a contribution to world culture in their own language and symbols.33 These positions do not, however, take account of animal or indigenous lifeworlds. In contrast to neoliberal ‘globality’ as well as most views on cosmopolitanism, we might attend to how the indigenous maps the world through a cosmological perspective that includes all our relations. As I understand it, it follows a contrapuntal spatiotemporality based in the dynamics of continuity and change. As such, it follows a trans-gressive and transformative rather than a now discredited progressive (linear) modernity. The cultural theorist Nikos Papastergiadis has done more than most to think through a critical framework for those contemporary artistic practices expressing what he calls a ‘cosmopolitan imaginary’, sympathetic to ‘developing new strategies for co-existence based on mutual understandings and (seeking) to create an understanding of new social possibilities by allowing each partner to go beyond their own certitudes and participate in collaborative knowledge-making that is not just the sum of their previous experiences.’35 Speaking from a perspective consistent with the thinking behind this Biennale, Papastergiadis points out that artists have moved from being ‘legislators to interpreters’. As I have said elsewhere, if the neoliberal ‘universal’ constitutes itself by negating difference, indigenous cosmopolitanism is a practice of mediation between the particular and the universal.36 Mediation, however, is not to be misconstrued as passive transmission but dynamic engagement; it concerns agency – the ability to initiate a swerve away from the conventional pathways of thought, to engage with, and open up different ways of thinking ethically and collectively that are responsive to the way each part is intricately woven into an indivisible wholeness. This can only happen if all entities are included as equal participants in the conversation. 1 Marcus Aurelius, Meditations, 167 C.E., trans. George Long, iv. 40. 2 Vine Deloria Jr., quoted in Thomas C. Gannon, C. G. Jung and the Sioux Traditions: Dreams, Vision, Nature, and the Primitive, New Orleans: Spring Journal Books, 2009, p 42. 3 Jean-Luc Nancy, ‘Urbi et Orbi’, in Creation of the World or Globalisation, trans. François Raffoul and David Pettigrew, Albany: State University of New York Press, 2007, pp 33-35. 4 Jacques Derrida, ‘The animal that therefore I am (more to follow)’, trans. David Wills, in Critical Inquiry, vol. 28, no. 2 (Winter), 2002, pp 369-418. And ‘Brian Yazzie Burkhart, ‘What Coyote and Thales can teach us: An Outline of American Indian Epistemology’, American Indian Thought, ed. Anne Waters, Oxford: Blackwell, 2004, pp 15-26. 5 If humans cannot directly know ‘what animals want’, they can at least make an effort to understand them on their own terms and ensure they do not inflict misery on their lives. 6 Gerardo Mosquera, ‘Spheres, Cities, Transitions’, 7th Sharjah Biennial catalogue, ed. Kamal Boullata, 2005, p 88. 7 Paulo Freire, Pedagogy of the Oppressed, (1972), trans. Myra Bergman Ramos, Harmondsworth: Penguin, 1986, pp 60-80. 8 Hannah Arendt, Eichmann in Jerusalem: A Report on the Banality of evil, (1973), Harmondsworth: Penguin, 1977. 9 Robert Berkowitz, ‘Introduction’, Thinking in Dark Times: Hannah Arendt on Ethics and Politics, eds. Berkowitz, Jeffrey Katz and Thomas Keenan, New York: Fordham University Press, 2010, p11. 10 Hannah Arendt, quoted in Peter Baehr, ‘Banality and Cleverness: Eichmann in Jerusalem revisited’, in Thinking in Dark Times, ibid, p 141. 11 David Bohm, Wholeness and the Implicate Order, London: Routledge, 1980, pp 6-8. 15 Vine Deloria Jr, op cit, p 99. 16 Steve Pavlik ‘In reality, animals still have no legal standing under the law themselves and whatever rights they possess are still largely derived as being part of the property rights of humans – if those property rights can be demonstrated in a court of law.’ Switzerland, Germany and Ecuador exceptionally have instituted laws by which nature may be a legal plaintiff. ‘Recognizing the Rights and Legal Standing of the Natural World: Revisiting Christopher D. Stone’s Essay from an Indigenous Perspective’; paper presented to the Western Social Science Association, April 16, 2009, Albuquerque. An earlier version was presented to the Third Vine Deloria, Jr. Indigenous Studies Symposium, Bellingham, Washington on July 24, 2008. Unpaginated. 19 Matthew Calarco, Zoographies: the Question of the Animal from Heidegger to Derrida, New York, Columbia University Press, 2008, p128-129. 21 Giogio Agamben, Remnants of Auschwitz: The Witness and the Archive, trans. Daniel Heller-Roazen, New York: Zone Books, 2002. 22 Gregory Cajete, ‘Philosophy of Native Science’, in American Indian Thought, ed. Anne Waters, Oxford: Blackwell, 2004,, pp 45-57. 23 Derrida, ‘The Animal That Therefore I Am (More to Follow)’, op cit, p 402. 24 Introduction to Native American Thought, ed. Anne Waters, Oxford: Blackwell, 2004, pp xv-xxxviii. 25 Vine Deloria Jr, The World We Used to Live In: Remembering the Powers of the Medicine Men, Colorado: Fulcrum Press, 2006, pp 149-166. 26 Vine Deloria Jr, ‘Philosophy and the Tribal Peoples’, American Indian Thought, op cit, pp 6-10. 27 Daniel R. Wildcat, ‘Indigenizing the Future: Why We Must Think Spatially in the Twenty-first Century, American Studies, 46:3/4 (Fall-Winter 2005), pp 417-440; Indigenous Studies Today, 1 (Fall 2005/Spring 2006). 28 Brian Yazzie Burkhart, ‘What Coyote and Thales can teach us: An Outline of American Indian Epistemology’, op cit, pp 15-26. 29 Steve Pavlik, Op cit. Unpaginated. 30 See Jean Fisher, ‘A Distant Laughter: The Poetics of Dislocation’, Intercultural Aesthetics, eds Antoon Braembussche, Heinz Kimmerle and Nicole Notes, Springer, 2009, pp 157-176. 31 Laurie Anne Whitt, ‘Biocolonialism and the Commodification of Knowledge’, Native American Thought, op cit, pp 188-213. 32 Kwame Anthony Appiah, Cosmopolitanism: Ethics in a World of Strangers, London: Penguin, 2007. 33 Ulrick Beck, The Cosmopolitan Vision, Cambridge: Polity Press, 2007. 34 Shanna Ketchum, ‘Native American Cosmopolitan Modernism/s: A Rearticulation of Presence through Time and Space’, Third Text 19,: 4, (July) 2005, pp 357-364. 35 I am indebted to Nikos Papastergiadis for his generosity in forwarding me his transcript to Cosmopolitanism and Culture, to be published by Cambridge: Polity Press, Jan 2012. 36 Jean Fisher, ‘Neither North Nor South’, in Sur, Sur, Sur, Sur/South, South, South, South’, ed. Cuauhtémoc Medina, Proceedings of the Seventh International Symposium of Contemporary Art (SITAC), Mexico City, 2010, pp 18-33. Several passages in the present essay are drawn from this previous presentation.